Over the last year, Olivia Foster (MA student in the Institute of Archaeology, UCL) worked as a valued member of the Petrie Museum team as collections volunteer. During this time, Olivia has undertaken a range of work on collections care, documentation and object loans, and in this blog she discusses one of her favourite objects in the Petrie Museum collection. This small and unassuming model boat in the Petrie Museum collection (UC10805) was recovered from a tomb in Abadiyeh during Flinders Petrie’s excavations in the late 1890s. 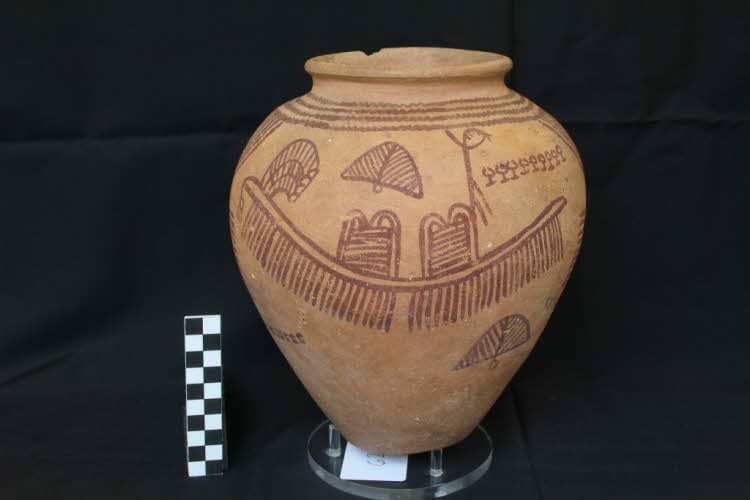 The decorated pottery object has been dated to the Naqada I period and the original function of the item is unclear. 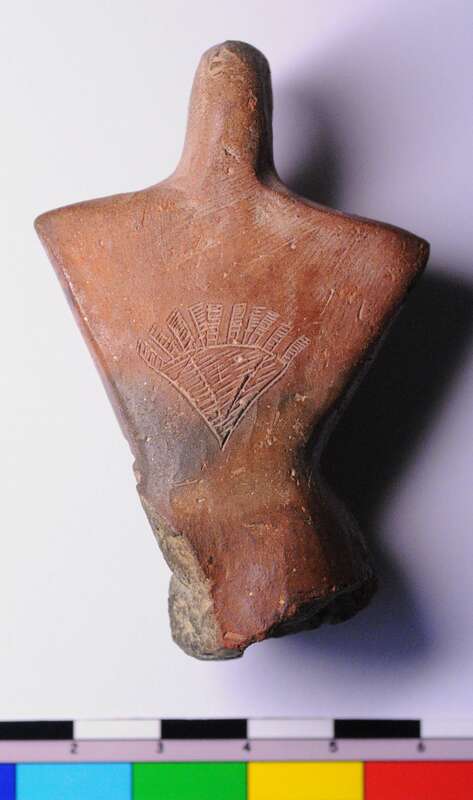 Objects such as this are important when it comes to understanding Predynastic Egypt, as they represent technology that has not survived in the archaeological record. Despite the important economic and symbolic role that boats are thought to have played in the Predynastic, no complete vessels have been found and archaeologists must instead rely on the art of the period to learn about their construction, size and function. This object and others like it also played a pivotal role in the heated debates between Petrie and his contemporaries as they discussed what exactly was being depicted in the decorated pottery of the era. The model is striking in its similarity to the shape of modern-day boats and the simple painted line decorations may hold clues as to how the boat was constructed. The narrow vertical lines on the sides of the object may be interpreted as lashing, with bundles of reeds or perhaps even wood forming longitudinal ribs to form a small canoe-type vessel. In addition to functional canoe vessels which may have been used for fishing or transport along the Nile, large watercraft with rows of oars are believed to have played an important symbolic and religious role in Predynastic Egypt. Boats are a common motif on decorated pottery, however these illustrations are abstract in nature and in the 1890s there was some dispute over what exactly they represented. 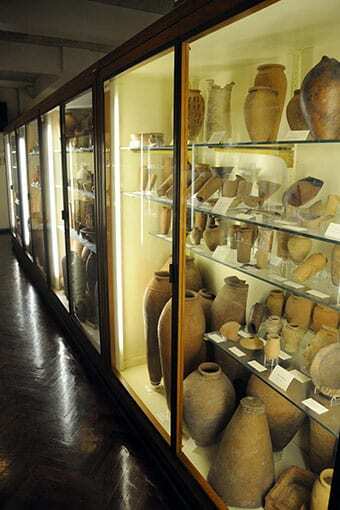 It was Flinders Petrie who first interpreted the decoration on Predynastic Egyptian ceramics as a ‘galley’ in the mid-1890s, Cecil Torr however proposed that the illustrations represented enclosures with two towers at the entrance. Model boats such as this example were used to dismiss these claims, as Petrie remained absolute in his interpretation of the motif as a boat and his assertion that vessels played an important symbolic role in early Egypt. The exact purpose of the model boat remains unclear and it may have had a decorative, functional or symbolic purpose or perhaps may even have been a child’s toy. The model boat clearly depicts a very different type of vessel from those commonly depicted and associated with Predynastic Egypt and offers a unique insight into more functional boats used by ancient people. Petrie, W. M. F. 1920. Prehistoric Egypt. London: Bernard Quaritch. 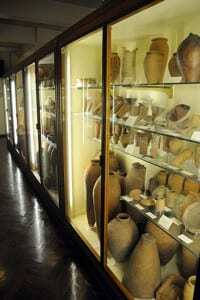 Petrie, W. M. F. Corpus of Prehistoric Pottery and Palettes. pl. XXXVII, D 81D. London: Bernard Quaritch. Uildrinks, M. 2018. Building a Predynastic: The Construction of Predynastic Galleys. Journal of Ancient Egyptian Interconnections. Vol. 17. Pp. 156-172. Predynastic Egyptian figurine UC9601 is very much in demand right now. She has just finished a stint as the poster girl for the Petrie Museum’s A Fusion of Worlds exhibition. 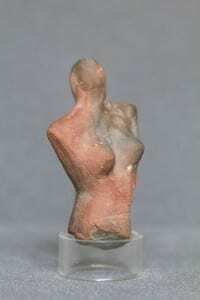 Now this petite, 6.6 cm-high pottery statuette is on her way to the Centre Pompidou-Metz, France where she will feature in the international exhibition Simple Shapes, alongside works by Barbara Hepworth, Pablo Picasso and Henry Moore. UC9601, Egyptian figurine dating to c.3600 BC. Excavated from the surface of cemetery 100 at Qau in the early 1920s. Design etched onto the back of UC9601. Representation of a tattoo, a garment or a basket? Guest Blog by Sisse Lee Jørgenser. In our fourth in the series on different perspectives on Egyptian pottery Sisse Lee Jørgensen, a student studying ceramics at The Danish Royal Academy of Fine Arts, School of Design Bornholm, Denmark, reveals how Petrie’s Sequence Dating inspired her recent installation. 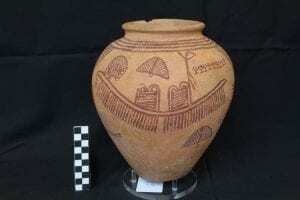 I was introduced to Petrie’s pots for the first time by the BBC4 program: “The Man Who Discovered Egypt”, and it was through this documentary that I learnt about sequence dating. As a craftsperson today I found this chronological ordering of ceramic vessels especially interesting, particularly the very striking development of form and design over time. Petrie’s findings illuminated crafting, culture and history, not just in the past but also prompted me to reflect upon ceramic traditions today and the way in which old crafts are transformed and passed on, yet retain elements of the old ways. 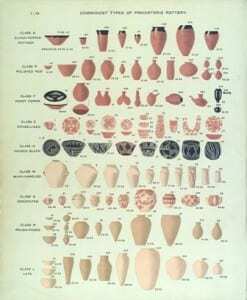 Flinders Petrie’s classification of Predynastic pottery. Frontispiece of Diospolis Parva (1901). Courtesy of the Egypt Exploration Society.